Cold shoulder tops were one of the hottest trends for spring and summer and it looks like they are continuing straight into Fall 2016. Our Santorini cold shoulder top was a best seller this summer for us and I knew I wanted to offer more cold shoulder tops in our shop for fall. The question I asked myself is how do you do a cold shoulder top and make it work for fall. I used a few of the points you see below to do our cold shoulder tops that you are seeing today. I wanted to share the points because you can use them in buying any cold shoulder top for fall. Look for them in darker, more fall oriented colors. Choose the ones with longer sleeves. Look for the tops made in heavier fabrics, there are even some in sweater knits. Wear them with shawls or wraps, and if the sleeve allows wear them under jackets. Today I am introducing you to our Chianti cold shoulder top and Licorice cold shoulder top. They are both the same style only two different colors, black and burgundy which are perfect colors for fall. The body is loose and easy to wear with a little bit of gathering in the front neck and the back has a small triangle cut out as a detail. The best part is the beautiful lace cuff in the bottom of the sleeves, which gives it a rich look. I styled the Chianti one with black skinny jeans and the Licorice one with white jeans. They both would work with so many other colors and would even look great with skirts. For accessories I added one of our brand new statement necklaces we have just added to our store that works perfectly with both colors. 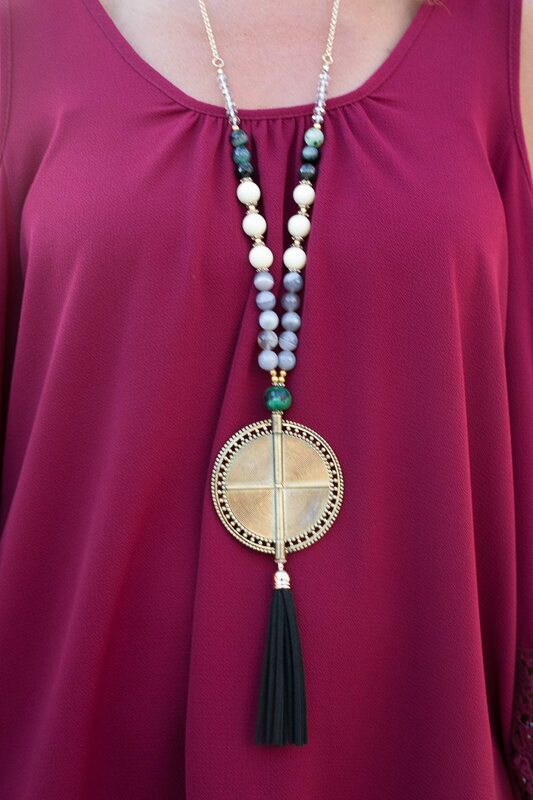 This necklace is hand made in USA using semi-precious stones. I also added one of our light weight leopard print scarf/shawl which is a very versatile piece you can use all throughout fall season. You can purchase the Chianti cold shoulder top here, Licorice cold shoulder top here, Semi precious stone necklace here and leopard scarf here. What are your thoughts on cold shoulder tops for fall and how do you like ours? Great cold shoulder tops! You look fabulous! Very pretty with the scarf, too! Love how you styled these outfits XO. Very pretty looks as always. Those shoes!!! Wow thank you so much for letting me know. You look beautiful! Totally agree that cold shoulder can be worn from Fall just make sure it’s darker for Fall!